Need a bright and fun card for a friend? This one would be great for a birthday or just to tell a friend how special they are to you. The bright patterns in the Parker’s Patterns DSP have really inspired me to use some brighter colors that I don’t typically use. Take a look. I started off by cutting a piece of Real Red card stock 4-1/4” x 11” and scored it at 5-1/2”. Next I cut a piece of Parker’s Patterns DSP 2-1/2” x 5-1/2” and a piece of Early Espresso card stock 1” x 5-12”. I adhered the DSP onto the card front, then adhered the Early Espresso strip onto the DSP. I stamped the image from Just Thinking onto a scrap of Whisper White card stock in Real Red ink and cut out the image with Paper Snips. Next I cut a piece of Night of Navy card stock 3-1/2” x 3-1/2”. I ran this through the Big Shot with the third from smallest Window Frames Framelit. 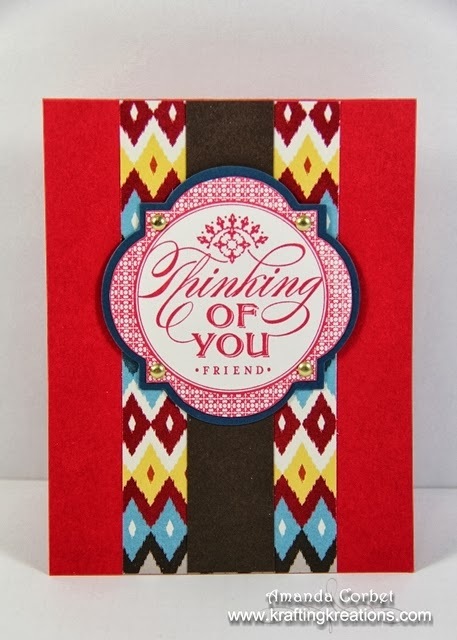 I adhered the “thinking of you” label onto the Night of Navy window frame then used my Paper Piercer and Stampin’ Pierce mat to add a hole in each corner of the label and inserted a Gold Brad in each hole. I adhered the label onto the card front with some Stampin’ Dimensionals.